WAIST HIGH: Happy 25th Birthday The Lexicon Of Love. Happy 25th Birthday The Lexicon Of Love. Released Jun. 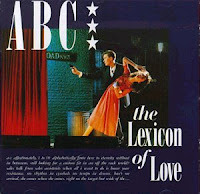 25, 1982, ABC's The Lexicon Of Love went to #1 in the U.K. on July 3. The Lexicon of Love was produced by Trevor Horn and features orchestration by Art of Noise member Anne Dudley. The Lexicon of Love not only established singer Martin Fry and guitarist Mark White as two of the decade's smartest and most skillful cross-breeders of Motownish dance grooves, but cemented ex-Buggle Trevor Horn's status as the era's defining producer. "ABC are one of those groups who come along once a decade to effect a paradigm shift in the way music is heard and made, one of those groups who move the music forward, alert us to the possibilities of strange combinations, employ radical ideas yet never confuse arrogance with ambition. "Their recordings are national treasures. First, now and forever, was The Lexicon Of Love, not just a sensational debut but one of the greatest albums ever made." In 1998 Q magazine readers voted The Lexicon of Love the 92nd greatest album of all time. "The Lexicon of Love stands as a landmark album in British pop."